Is My Credit Union Federally Insured and How Do I Know? All federally insured credit unions must prominently display the official NCUA insurance sign shown below at each teller station and where insured account deposits are normally received in its principal place of business and in any of its branches. Federally insured credit unions are also required to display this official sign on its Internet page, if any, where they accept deposits or open accounts. A credit union may not end its federal insurance without first notifying members. Federally chartered credit unions are regulated by the National Credit Union Administration and insured by the National Credit Union Share Insurance Fund (NCUSIF), which is backed by the full faith and credit of the United States government. Established by Congress in 1970 to insure member share accounts at federally insured credit unions, NCUSIF is similar to deposit insurance coverage provided by the Federal Deposit Insurance Corporation. Some deposits at state-chartered credit unions are insured by private insurers. These private insurers provide non-federal share insurance coverage of deposits that are not backed by the full faith and credit of the United States government. 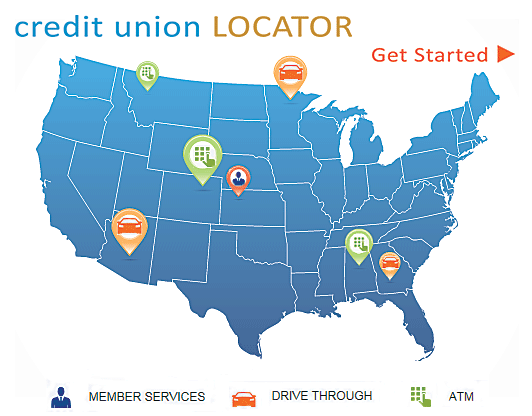 You can tell if your credit union is federally insured by NCUA by searching for a credit union in Find a Credit Union. In addition, credit unions must display in their offices the official NCUA insurance sign. All federal credit unions must be insured by NCUA, and no credit union may terminate its federal insurance without first notifying its members. Federal Credit Union: NCUA regulates and insures federal credit unions. A federal credit union can adopt a trade name for use in advertising but its official charter name, which must have the word "federal credit union" in it, must be used in all official or legal communications or documents. State-Chartered Credit Union: State-chartered credit unions are regulated by the state supervisory authority where the credit union's main office is located and may or may not be insured by NCUA. The Share Insurance Fund (opens new window) is backed by the full faith and credit of the United States. Credit union members have never lost a penny of insured savings at a federally insured credit union. The Share Insurance Fund maintains at or near 1.30 percent of federally insured credit union deposits. By law, federally insured credit unions maintain one percent of their deposits in the Share Insurance Fund, and the NCUA Board can levy a premium if necessary. This toolkit contains a variety of helpful resources for credit unions about NCUA's Share Insurance Fund Program. Calculate the amount of your insured funds at a federally insured credit union using NCUA’s Share Insurance Estimator. The estimator can be used for personal, business or government accounts. Personal accounts include individual ownership, joint ownership, payable-on-death (accounts with named beneficiaries), living trusts and IRAs. The Estimator also includes an extensive Glossary of Terms and Frequently Asked Questions. View three videos illustrating NCUA’s share insurance coverage. View, print, or download one of the below NCUA Share Insurance publications (in English or in Spanish). 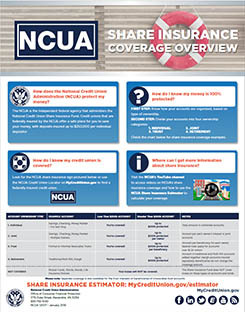 This one-page flyer is easy to follow and highlights the basic share insurance coverage provided by NCUA for various account ownership types. This easy to follow two page pamphlet highlights basic share insurance coverage provided by NCUA for various account types. This multi-page booklet provides a more in-depth look at NCUA’s Share Insurance coverage and includes examples to help you understand the protection provided. Credit unions encourage their members to save regularly to build economic security for themselves and their families. Deposits at all federal credit unions and the vast majority of state-chartered credit unions are covered by NCUSIF protection. Not one penny of insured savings has ever been lost by a member of a federally insured credit union. For additional questions about NCUA’s share insurance coverage, call 1.800.755.1030, option 1 or send an email to DCAmail@ncua.gov.